Audiomatic Retro Transformer is a psycho-acoustic future retro effect, inspired by the photo apps in your phone. Add Audiomatic to any instrument, channel or group — or the whole mix — and select one of the 16 snapshots: VHS, vinyl, gadget or even mp3, to instantly sprinkle audio magic over your tracks. Audiomatic Retro Transformer is a psycho-acoustic future retro effect with plenty of personality. Add Audiomatic to any instrument, channel or group — or the whole mix — and select one of the 16 snapshots: VHS, vinyl, gadget or even mp3, to instantly sprinkle audio magic over your tracks. Tweak the effects with the Transform control. Some programs go from subtle to significant. Others all the way into the supernatural. Add a little bit of Tape squash, a Hi-Fi stereo boost of the highs and lows, make your sounds brighter or get more punch in the low-end. Spread makes your sounds wider, Radio like they're coming from a small speaker. VHS adds a lo-fi vibe, and the vinyl preset adds the trademark 60hz rumble, hiss and crackles from everybody's favorite plastic. mp3 sounds just like the real deal. With Psyche, Cracked, Gadget, Circuit, Wash, PVC and Eerie your sounds are transformed into the unknown, turning into something completely new. Not always predictable, but pretty and powerful nonetheless. 16 preset sounds, from lo-fi to hi-fi, PVC plastic to vinyl. Designed for Reason's parallel and group mixer channels. Add Audiomatic to a group to completely transform your sound, or apply it subtly by blending it on a parallel channel. Alter the sounds with the Transform control. Every preset can be varied to fit perfectly into your song. 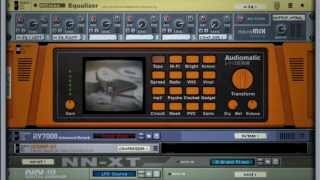 Audiomatic is included free with Reason version 7 or later.